In April, CEO Tony Hayward announced that safety was the company's "number one priority". 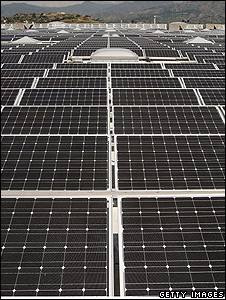 Some environmental groups saw this as an attempt to move away from "green" as a brand value, which was introduced by Mr Hayward's predecessor, Lord Browne. BP's current logo (top) reflected the company's move "beyond petroleum"
Greenpeace said the oil giant had a lot to gain by dropping its promise to be green. 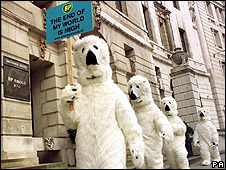 Charlie Kronick, Greenpeace's senior climate change adviser, suggested that the pledge was the only thing holding it back from making further cuts to its green credentials. "Now that BP is blissfully released from its pledge to invest in clean energy, it has a carte blanche to sell off its unprofitable green energy arm," he told the BBC. "It can get back to doing what it does best: being a 100% fossil fuels train wreck," Mr Kronick added. "This is classic smoke and mirrors." BP denies that it is back-tracking on its commitments to climate change. "The change represents an evolution and expansion of green as a brand value rather than a replacement," said spokesman David Nicholas. "The new brand value, 'Responsible', encompasses BP's original aspirations towards the environment, in addition to other key areas such as safety and social welfare," he explained. "Our aspirations remain absolutely unchanged: no accidents, no harm to people and no damage to the environment." Tom Woollard, a director at environmental consultancy ERM, which counts BP as one of its clients, is inclined to agree. "I don't think BP has taken a step backwards on being green," he told the BBC. "The people I know who work at BP are still as committed as ever to upholding green values, despite the change." However, BP's low-key roll-out of the new brand values does mark the end of an era. 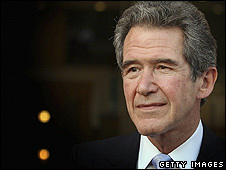 Lord Browne's re-branding in 2000 promised that the company would move "Beyond Petroleum" by finding cleaner ways to generate energy, and listed "performance-driven, innovative, progressive and green" as its brand attributes. Britain's green energy sector flourished, as Lord Browne's shining for solar power went head-to-head with rival oil giant Shell's investment in wind projects. Both oil titans lavished huge quantities of money on slick green advertising campaigns. But Rita Clifton, chief executive of brand specialists Interbrand, said high-profile promotions could be a double-edged sword. "You can't promise in an advert what you aren't delivering on a day-to-day basis and not expect a backlash," she told the BBC. And the backlash was fierce: campaigners demanded to know what exactly was green about being responsible for a massive oil spill on Alaska's North Slope"; investing in the extraction of oil from tar sands (described by campaigners as "global warming's greatest crime"), and spending less than 1.5% of its budget on solar power. BP's environmental credentials suffered a further setback in 2008 when the company announced its intention of withdrawing financial support for a scheme that monitored mangroves next to a liquefied natural gas (LNG) plant it was constructing in Papua, South-East Asia. "Withdrawal of BP's support for the monitoring process goes against all the green rhetoric that is so prominent in BP's public relations and marketing exercises," campaigners at TAPOL, Down to Earth and a number of other human rights organisations wrote in a letter to BP CEO Tony Hayward. Paul Barber, a TAPOL spokesperson, says that BP has also broken its promise to reinject the carbon dioxide which will escape into the atmosphere from the gas field. "About 12% of the gas field is carbon dioxide, which will now be vented directly into the atmosphere because BP has backtracked on its promise to institute carbon capture and storage at the Tangguh gas field," Mr Barber told BBC News. BP's tone changed in 2008 when Tony Hayward, who replaced Lord Browne in 2007, intimated that he was looking to "monetise BP's Alternative Energy Business". And BP recently pulled clean out of Britain's green energy sector, cutting investment in renewable energy by 30%, and cutting its solar power workforce by a quarter. Time for a new look then? And if so, what? BP has rebranded itself as "responsible" in order to regain the trust it lost following the 2005 Texas City explosion, which killed 15 people and injured more than 170 others. The incident was described as "one of the worst industrial accidents in the history of the US" by ERM's Tom Woollard. It led to a record fine of more than $21m by the US Occupational Safety and Health Administration. It also resulted to BP picking up the nickname "Big Problems", and the episode "seriously shook BP's bond of trust with investors", says Rita Clifton. Tony Hayward has worked hard to regain the public's trust by improving the safety of BP's operations. In April, he announced that safety was the firm's "number one priority". "A new brand value is BP's way of saying that safety is now a top priority," Mr Woollard explained. "It's a promise to potential partners that another Texas City is not on the cards," he added. It would be easy to jeer at BP for casting off what many have always considered to be a half-heartedly green mantle. But is it any wonder that BP is reverting to its old habits, given the scepticism with which campaigners greet the green shoots of green thinking in the senior management of oil companies? When confronted with the prospect of sneering green groups, it could well be that any oil company toying with the idea of experimenting with green initiatives - beyond the near term interests of their shareholders - will think twice. And anyway, as Lord Browne outlined in a recent speech at Cardiff University, perhaps saving the world should not be left to the oil companies. If the world could not incentivise green behaviours using good ol' capitalism, Lord Browne noted, it had to be accomplished via legislation, if it can be done at all.